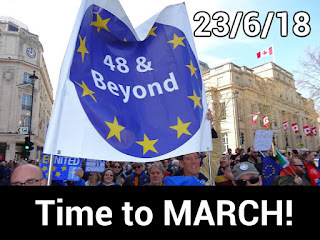 The 48 and Beyond : Time to MARCH! The 48 and Beyond team urges everyone who can join the protest in London for 23rd June - its time to remind the Government we are as united today as we have been since the so-called referendum. ...meanwhile, the Government is so busy fighting itself it has no idea what its own strategy is! Whatever people voted for in 2016, we are sure they didn't vote for job losses, poverty, global derision, and increased hatred on the streets. On June 23rd protest to demand - at the least - a vote to stop this madness. If your like us you will likely be demanding this entire lunacy is stopped immediately!